Old Globe artistic director Barry Edelstein has chosen Grantham Coleman, an L.A.-based Juilliard graduate with stage and TV credits but minimal Shakespeare experience (“As You Like It” at the Public Theatre, “Romeo and Juliet” at the Actors Theatre of Louisville), to assay the tortured Danish Prince. The gamble paid off. Grantham attacks the role with ferocity. He’s a formidable Hamlet: angry, aggressive, athletic and prone to self-loathing. No morose, mewling, neurasthenic whiner, he. He jumps and climbs with robust agility. He’s more aggrieved than grieving at the outset — because of his mother’s surprising re-marriage almost immediately after his father’s untimely death; that is, before the ghost of his father informs him that Hamlet Senior was murdered by his brother, Claudius, who then wed his sister-in-law, Gertrude, Hamlet’s mother. Over the course of 3-plus hours, this Hamlet displays a wide range of colors and emotions, from blind rage to twisted logic, and both feigned and probable madness. Even though fury seems to drive him, he falters in wreaking the revenge he is bidden to seek. 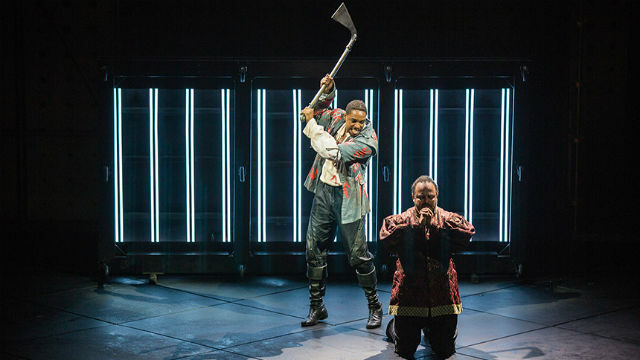 Edelstein is a long-time Shakespeare aficionado, but this is his first direction of “Hamlet” (it’s the eighth “Hamlet” production for The Globe, the most recent being in 2006), and he definitely puts his stamp on it. His production is unique in many ways, though not all the stylistic flourishes are successful. The stage is set (by Tim Mackabee) with movable gold panels and platforms, loomed over by a gigantic suit of gilded armor, presumably representing the beloved late King. The ghost will similarly appear in gold armor (which lights up!). We see no spectral or fearsome vision; this ghost (Michael Genet) has a resonant and commanding voice, but he seems more corporeal than ethereal. And breaking the unwritten rules of such late-night visitations, he actually touches his son, several times, including in the final moments of the play — after Hamlet’s death. Physical contact and an undertone of sexuality are rife in this production. Hamlet brazenly lays his hand on the torso of his primary love interest, the chaste Ophelia, which would be highly unlikely in this time and place — even in a moment of (feigned) madness. He flirts with and kisses a female Guildenstern (Nora Carroll, a student in the Globe/USD MFA program), who’s paired with a foppish Rosencrantz (fellow MFA student and Globe returnee Kevin Hafso-Koppman). The new King (forceful Cornell Womack) and Queen (aptly ambivalent Opal Alladin) have randy sexual sport on their huge bed, while courtiers look on uncomfortably. The bed gets a pretty good workout throughout. Hamlet leaps and prances on the royal bed, and Ophelia (Talley Beth Gale) in her compelling, heart-breaking mad scene (she’s stiff and distancing up till then), jumps on the Queen’s bed to distribute not flowers, as she names them, but twigs from a stark corona she wears. A poignant and shattering moment. As Polonius, the loquacious councilor to the king, Patrick Kerr is fretful and often humorous, and less a laughable buffoon than in some productions. His reading (from someone else’s words, ostensibly) instead of extemporizing fatherly advice to his son, the impulsive Laertes (Jonny Orsini) is an especially nice directorial touch. The costumes (Cait O’Connor) announce the production’s tone as much as the scenic design. When Claudius and Gertrude make their first entrance, they look “very like” fugitives from another Shakespeare play: “A Midsummer Night’s Dream’s” Oberon and Titania, king and queen of the fairies. Gertrude’s getup even sports what appear to be wings. All the clothes are garishly colored and wildly exaggerated (cartoonishly oversized sleeves, outrageously large skirts). Typically, the colors are drab or muted in the dank cold of the “rotten” state of Denmark. But this is a far more fanciful kingdom. There’s humor where it’s unexpected (especially in the first hour or so, where it seemed that “Hamlet” had become a comedy), but not where it’s unequivocal in the text: the gravedigger scene preceding Ophelia’s funeral (Genet again, who fares better as Ghost and The Player King). The original music (by Curtis Moore), some of it played live, is heavy on fanfares and trumpeting brass, which seems a mismatch with the increasingly tragic proceedings. The sound (Sten Severson) is crisp and the lighting (Stephen Strawbridge) effectively carves out time, place and character. But in this most complex and enigmatic of plays, little is left to the imagination. There’s an on-the-nose quality here. When someone is spoken of, for instance, he appears in the upstage shadows. This adds to a general lack of subtlety and nuance. And yet, the performances are strong, and the language is beautifully handled throughout. The story is clearly told and well-articulated. And the sum total feels satisfying, in spite of the liberties taken and some of the less than felicitous changes and choices. For those who don’t know “Hamlet,” this is a playful, colorful and entertaining introduction. It’s lighter and much more amusing than most, despite the bodies piling up in the final scene. For diehards and devotees, it might seem a stretch at times, but you can’t deny the potency and dynamism of Coleman’s portrayal. You’d be hard-pressed not to get sucked into this captivating Hamlet’s doomed, ill-fated tale. Performances are Tuesday-Sunday at 8 p.m. Starting September, some performances will be at 7 p.m. Check schedule. Running Time: 3 hrs. 15 min.